4 JG’s Orchards & Vineyard, Colts Neck – guests can kick off the winery’s season with the Taste from the Barrel Weekend. Come in the cool barrel room for a taste of wine still in barrel. Bellview Winery, Landisville – Barrel Tasting Weekend July 15th and 16th 10 am to 5 pm – Ever wonder what your favorite wine tastes like straight out of the barrel? Are you interested in getting that wine 50% off? If so, the Bellview Winery Barrel Tasting Weekend is the event for you. Sample the next upcoming vintages as well as selections from our Celestial Series. The Celestial Series is a series of blends that were featured on tap in the winery. Due to popular demand, these blends were bottled in small batches that are typically not available for tasting. Join us to celebrate the wines to come on July 15th and 16th from 10AM – 5PM. Chestnut Run Farm – The Wine Shop at Chestnut Run Farm will be open for tastings during the Barrel Trail Weekend! Since our little wine shop is only open a few weekends each year, this is a great opportunity to come out to the farm, see where all the fruit used to make our wines is grown, and to sample our wines on our peaceful Salem County farm. Why not make a day of it by visiting our neighboring wineries on the Two Bridges Wine Trail? Hawk Haven Vineyard,Rio Grande – has their regularly scheduled Vineyard & Winery Tour daily at 1pm. Taste through Hawk Haven wines and hear a discussion from a guide on every step of the wine making process from the vineyard to the vast steel tanks and French oak barrels. Discover what makes each wine unique and how our wine maker achieves every flavor and aroma. The tour concludes with a selection of gourmet cheeses to enjoy on the vineyard view crush pad and cozy barrel room. Call (609) 846-7347 for reservations. $25 per person includes tour, wine tasting, cheese, and souvenir glass. Hopewell Valley Vineyard, Pennington – Live music on Saturday and Sunday and a vineyard tour with a complimentary wine tasting on Saturday, July 15 at 2 pm. Iron Plow Vineyards, Columbus – Straight out of the Barrel Room, a vertical tasting of two unreleased Merlots. The 2016 will be taken directly out of the barrel for you to taste. The 2015 Merlot is also available to taste which is not yet released, but will be available for purchase this weekend only. This special additional tasting if free to anyone who purchases a regular tasting. Laurita Winery, New Egypt – July 15 and 16 Laurita has a red white and blue and food trucks event and we will use our vineyard wagon tours as our educational offering. They are free to the public and wonderful. 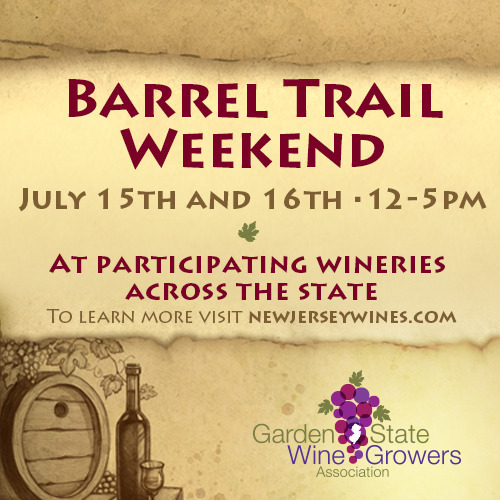 Natali Vineyard, Cape May – Barrel Trail Weekend – July 15th & 16th from 12-4pm. Join our winemaker for a tour of the barrel room and try a few of our wines right from the barrel. Sharrott Winery – Do you know what a Wine Thief is? What is the angel’s share? Tomasello Winery, Hammonton – On Saturday & Sunday, July 15 & 16th from 1-5pm, join us for Barrel Trail Weekend at Tomasello Winery. Enjoy barrel tastings of select wines, plus special discounts both days on our Palmaris Reserve Wines. Specialty Cocktails, Martinis, Mixed Drinks and Tapas will also be available for purchase. Villa Milagro Vineyards, Finesville – guests will chill in their “Chill Room” where you will learn how they finish, age and bottle their wines using no additives. Visitors will sample future vintages directly from the barrel and then sample currently bottled wines. $10 includes tour, wine tasting, appetizer plate and gift glass. On Sunday, guests will have a chocolate tasting with Chocolate Lab from Bethlehem, PA.